London is an amazing place for taking photos and over the past few years I’ve visited it a couple of time. As I suppose everyone does you start with the famous landmarks and after doing a few of the standard shots its time to start exploring. 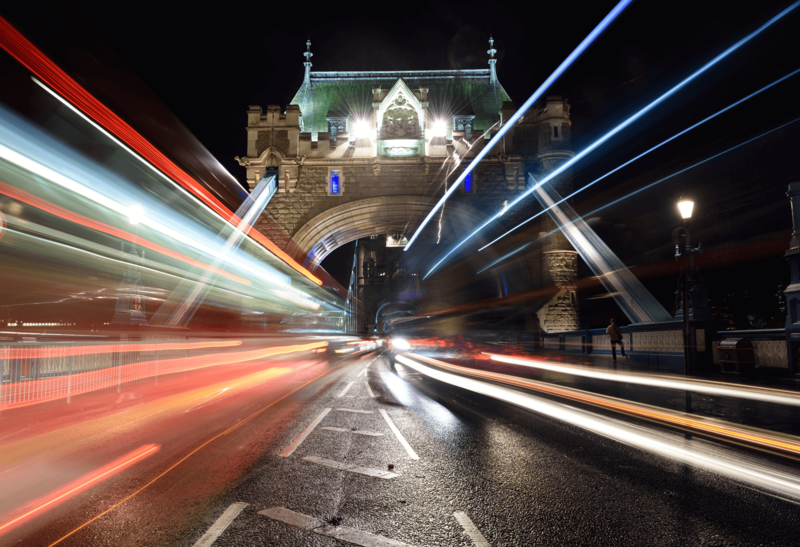 This London Bridge shot was created from two shots. I got the tripod set up focused the camera and then waited. There was amazing traffic on the right side including a London bus, coach and loads of different sized cars which left great trails and on the right side there was just a car and what looks like a bike going past. Keeping the camera in exactly the same place I re shot the traffic on the right side waiting for a bus and some taller vehicles and in Photoshop masked out the other side of the traffic leaving two great light trails. I noticed on editing the shot the woman on the right side who stood perfectly still for ages.